A logo is not just an identity of a business organization rather it is a symbol which distinguishes a company from other brands in the similar niche and industry. Finding a trend that is perfect for your delivering your company’s message is not as easy as it sounds. It requires great and detailed work which can be tricky. When it comes to marketing your brand, selecting the best fit logo design trend is one of the crucial requirements of logo designing and marketing processes. Every New Year brings newer logo design trends and styles. There is no better time than New Year to update and innovate your brand’s logo design and to update its look. 2019 is all about innovation and revolutionizing the orthodox practices, same is the case with logo designing. This New Year designers are more inclined towards experimenting with different colors, patterns and styles of logo design to create a better and more innovative logo design trends and techniques. With the advancement of technology in every aspect of our lives, logo designing is no different to it. In this highly digitized age, not only designers are introducing better trends rather developers are also experimenting and using different logo design software free online to create better and high-quality logo designs. Logo designing has been in the business world for a long time, and there’s no denying that a potential logo is one of the most powerful marketing tools. Creating a logo that reflects the latest trends but targets and grabs the attention of the relevant audience is a crucial part of every business marketing strategy. The logo designers of this modern age are more concerned about creating meaningful logos rather than integrating aesthetic styles and patterns in logo designs. Nowadays, business organizations and companies want to have contextual logos as these logos are used for marketing purposes and are used on different marketing platforms. ‘Simplicity never goes out style” this saying is well-suited when it comes to logo designing. Using over-complicated logo designs is never a wise thing to do. Most of the business organizations and manufacturing companies go for simpler designs rather than complex logo designs trends and practices. Using a visually appealing yet simple logo design is a common opinion given by several professional marketers and experts. It is one of the most commonly used and practiced logo designing approach. However, this approach has been introduced with a slight innovation, this year. This new year, designers are discovering newer ways and methods to integrate architectural structures in logo designs. Using architectural landscapes in logos not only gives the logo an appealing look but it also introduces a geometric essence to the logo design. Logo designing has always been regarded as a fun and creative job. Creativity is the must-have quality of a logo designer. This year designers are coming up with design trends that are not only fun to create, but they also help the designers in experimenting with his creativity by fusing different patterns, styles, and colors. There is no single way of creating logos. Numerous tools and software are available on the internet which have hundreds of features and thousands of templates which helps the designers in testing his creative abilities. Metaphors have been used in logo designing since its beginning and this New Year designers are using these metaphors in innovative ways to create deep meaningful logos. Using metaphors in logo design makes it more contextual and give meaning to the logo. Another great aspect of using metaphors in logo designing is that it helps in introducing new creative branding possibilities. Typography has gone through several experiments and innovations, and this New Year another great innovation has been integrated into typography. From using different font styles and typographic shapes to using illustrative and photographic techniques, the dynamics of typography has gone through numerous modifications and innovations. This year, designers are applying innovative ideas and concepts to use technologically advanced tools and software in creating better and more advanced typographic techniques and trends. Grid lines are the backbone of graphic designing, without setting and determining proper gridlines no graphic designer can produce high-quality imagery. Gridlines are used to perfect the under-development image, be it a logo or an animated character. Grid-based logos have been in the logo designing industry for as long as we can remember or we can say that this designing approach never left the logo industry. One of the widely-practiced technique of using gridlines is to couple gridlines with typographic content. 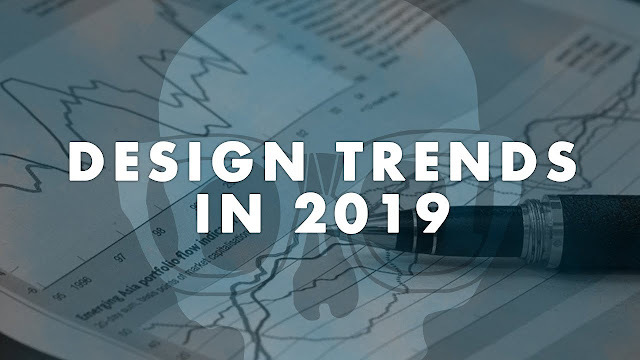 By reviewing the upcoming designing trends of 2019, it is safe to say that this trend is sure to make a huge comeback in the logo designing industry. This trend is a fusion of different trends, i.e., vibrant color trends and abstract patterns trend. In this approach different patterns are used to add meaning and context to the logo design. As a designer if you want to experiment with your creativity, practice this approach of logo designing. The 2019 look like an interesting year for the logo and graphic designers. 2019 is the year where designers will not only experiment with their creativity, but they will surely admonish and innovate the orthodox logo designing practices and approaches.